We have been evaluating pre-production models of Pixel Enterprise's upcoming Pixel King wireless TTL flash triggers for Canon. Do they work reliably? Are they easy to use? Find out in our first review. A more comprehensive review, written by Richard Bradbury, is now available to view here. We have been evaluating pre-production models of Pixel Enterprise’s upcoming Pixel King wireless TTL flash triggers for Canon. Do they work reliably? Are they easy to use? Find out in our first review, written by Harry Pilbeam. This review looks at the Pixel Enterprise model ‘King’ wireless flash trigger, 1 transmitter and 2 receivers, used in conjunction with a Canon 7D, a Speedlite 430EX II, and a Yongnuo YN462 manual control flash gun. The review was carried out in a studio under practical studio conditions; and outdoors, again under practical conditions of use. The writer has no relationship with either Pixel Enterprise or Lighting Rumours. ‘King’ Transmitter (Tx) fixed to Canon 7D via flash mount; A ‘King’ Receiver (RX) attached to each flash gun, and positioned either side of the subject. 7 user selectable channels, 2.4GHz two way communication, operation range over 100 metres. Flash Modes – E-TTL II, TTL, Manual. Group Control – Up to 3 groups (7 combinations). Tx – USB, PC cable outlet, hot shoe input and hot shoe output. Rx – USB, PC cable outlet, hot shoe output. Supports 580EX II, 580EX, 430EX II, 430EX, 550EX. Supports functions through camera menu on 40D, 50D, 60D, 5D, 5D mark II, 7D, 1D mark IV, 1DS, 1DS Mark II. Dimensions – length 88mm, width 55mm, depth 36mm, weight with batteries 120gm. Mounting – metal shoe with plastic insert and standard Canon connecting pins, with knurled locking ring. The transmitter is mounted on the camera’s hot shoe. There is a facility for mounting a flash on top of the Tx via a hot shoe. Channel selection and group selection are made via lateral switches with LED indicators. 3 way on/off switch on side. All controls are accessible when mounted. Battery cover is on the underside, not easily accessible when mounted. Dimensions – length 88mm, width 55mm, depth 36mm, weight with batteries 110gm. Mounting – Cold shoe mount underneath (for stand etc), complete with ¼” screw and knurled locking ring. A flash can be mounted in the hot shoe on top of the Rx. Battery cover is on the underside, accessible when mounted. A blue LED flashes during transmission of data. Connectors available on side for triggering studio or non-Canon flashes. Tx – mount Tx in the camera’s hot shoe, turn camera on, turn Tx on, centre position has no function at present). Set channel (CH SET) to 01 using lateral switch, press and hold for >2sec LED will flash, release switch then press repeatedly to step through sequence to select channel 01. Any 1 of 7 channels may be selected. Set grouping required (GP SET) by pressing and holding switch for >2sec LED will flash, release switch then press repeatedly to step through sequence until required grouping LED is flashing, release switch. Any 1 of 7 combinations may be used. Rx – set Rx channel to match the Tx channel. Assign the receiver to the group setting of your choice, with the proviso that it matches one of the group setting on the Tx. Eg if there are two receivers, one assigned to group ‘A’ and the other to group ‘B’, the transmitter must be set to ‘A’ + ‘B’ for both flashes to fire. If the Tx is then set to group ‘B’ only, only group ‘B’ will fire. A red LED will flash slowly. Take a shot – ½ press the shutter button, a blue LED will flash during data transmission, which is continuous whilst the shutter button is ½ pressed. Fully depressing the shutter takes the shot and fires the selected flash(es). A very stylish piece of equipment, the design is excellent and the Tx and Rx controls are very well laid out and user friendly, very easy to use. Using the Speedlight 430EX II meant that I could not test the Flash exposure bracketing capabilities as this function was not available to me, this was not a failure on the part of the flash triggers. All results were consistent and there were no failures whatsoever. Distance test – testing was carried out at a distance of 100 metres and no failures were noted. When flash was attached to receiver, menu in camera indicated that Flash Exposure Bracketing was available when it was not, the menu should be greyed out. When attached to Tx, menu indication was correct. 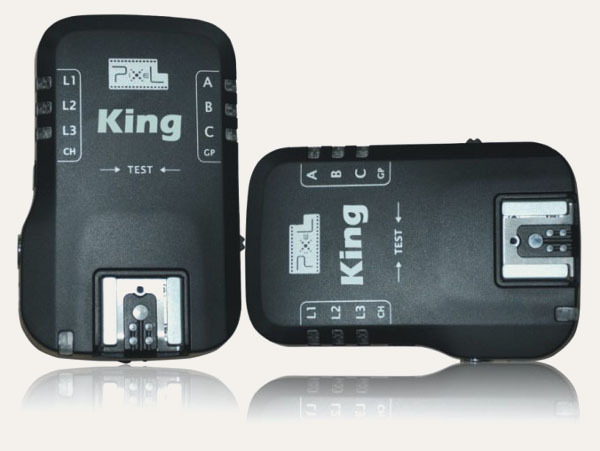 More technical information on the Pixel King wireless E-TTL triggers can be found on the manufacturer’s web site. Upon release, they will be available for sale at the official Pixel Enterprise eBay store. Harry Pilbeam is a photography tutor from Teesside in the north-east of England.